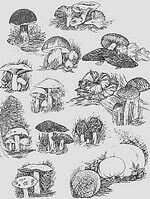 Think of the perfect mushroom appetizer, and you're probably thinking of the Forest Mushroom Rhapsody proudly served at the Garden View Restaurant at the Oregon Garden Resort. It's plump with sun-dried tomatoes and seasonings folded into a medley of oyster, shitake and cremini mushrooms and encased in filo dough...truly a remarkable visual and taste treat! For an entree, I selected the half duck, and it arrived with a delicious and seasonally appropriate cranberry sauce and red potatoes. Steven's prime rib was a generous portion cooked to perfection and accompanied with red potatoes and very forgetable vegetables. Dessert? No way. After 2 helpings of the delicious crusty rolls, Steven and I found ourselves carrying take-out boxes filled with generous portions of our entrees back to our room to be savored at a later time. 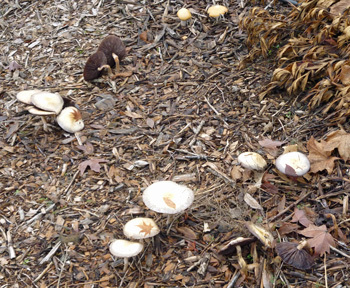 Silverton's freezing fog couldn't stop this fungal fruiting in the Oregon Garden. 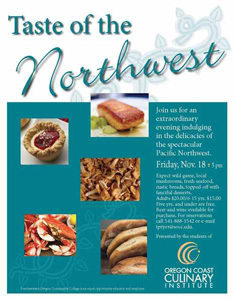 Late in 2011, the Oregon Coast Culinary Institute (OCCI) hosted the Taste of the Northwest, an extraordinary event which featured an exotic menu of wild game, local mushrooms, fresh seafood, and rustic breads along with fanciful desserts at the Coos Bay campus of Southern Oregon Community College. The main dishes included such items as cedar planked cured salmon, butternut squash and goat cheese ravioli, elk tacos, halibut en papillote, crab cakes, and smoked duck with sweet potato hash. The dessert tray featured such items as chocolate hazelnut tartlets, persimmon buttermilk sherbet ice cream cones, brown butter apple upside-down cake with Apple Jack carmel, and pumpkin pie truffle. We have it on good authority that one of the highlights of the evening was the Porcini & Hazelnut Dressing, and we're pleased to present it as the first recipe of 2012. Thanks for sharing your recipe for this tasty preparation, Shawn L. Hanlin, CED and Executive Director of OCCI! The Porcini & Hazelnut Dressing was a favorite at OCCI's dinner. Thanks to our dear friend Paula, I was recently able to read an article entitled "Morel Fever" in the Early Spring 2011 edition of County Gardens. The writing was well done. And, the photography by Greg Scheidemann and Marty Baldwin quickly had my mouth watering for morels. 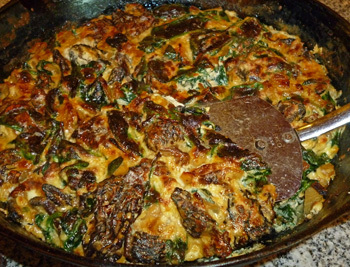 We couldn't resist trying the Morel Frittata recipe that was featured in the article, and I think that it's already become a favorite recipe! It's quick to prepare, lovely to look at, and simply delicious. We made some changes to the printed recipe (don't we always!) which we think enhance the original recipe and make it a richer presentation. For example, we sauteed 1 cup of chopped onions instead of 1/2 cup, substituted heavy cream for the half-and-half, and served it with a dollop of sour cream. We used 1 ounce of our dried morel mushrooms in place of the printed recipe's 4 ounces of fresh morels. The cast iron skillet was a perfect cooking vessel.